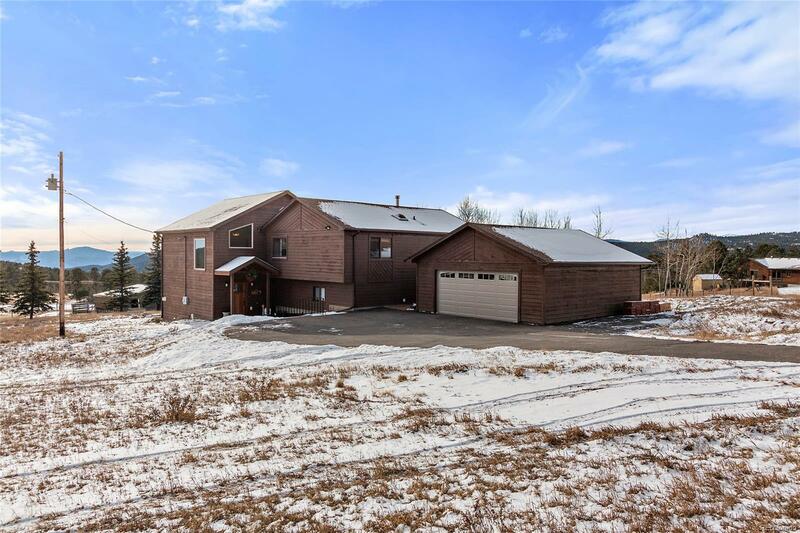 This large mountain home has tons of room both inside & out. Walking through the front entry youâll take notice of the tall, vaulted ceilings, natural light & combination of tile & wood floors. The new, large deck can be accessed from the great room w/wood beams & cozy wood fireplace opening to the kitchen. Spacious master bedroom has a large wall of windows, walk in closet & updated bathroom includes granite counters, travertine tiles, shower & tub. Lower level has so much potential & opportunities waiting for your personal touch. There are multiple living rooms, 4th bedroom w/opportunity to be a guest suite, laundry room & a rough-in bathroom to easily finish out. Outside fall in love w/the almost flat/usable land mixed w/rock outcroppings, meadow & aspens. Bring your horses, the lean - to can be used for horses or for extra storage. Fall in love w/this mountain home that has room for everyone & opportunities to make it your own! Area for garden, new roof & exterior paint in 2015.